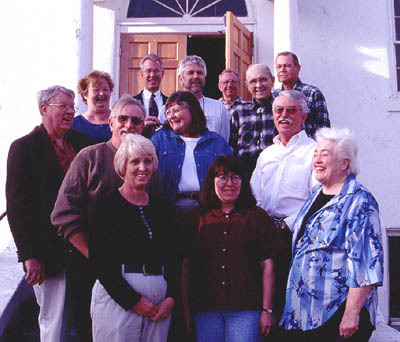 Members of the Grafton Heritage Partnership Project enjoy a laugh before their monthly coordinating meeting at the Community Center in Rockville, UT. Shirley Ballard, GHPP Trustee and Grafton land owner. The Grafton Heritage Partnership Project is a 501 (c)(3) non-profit organization dedicated to the preservation of Grafton as an historic site. The Partnership is preserving traces of our past to honor early settlers ‘ hard work, to remind us and our children who we are and where we came from. Donations are gratefully received and are tax deductible as a charitable contribution. Please give what you can. When the Grafton Heritage Partnership was founded fifteen years ago, our vision of preserving Grafton as an historic site was a dream. We have come a long way since then and with your help we have made a dream come true. To date we have raised over $1,750,000 to purchase the property, restore buildings and maintain the scenic agricultural property. In order to secure the future of Grafton, I am writing you today to ask that you donate to our newly created Grafton Endowment Fund and ask you to remember Grafton in your will. The purpose of the fund is to endow long-term operational and financial support for the Grafton Heritage Partnership Project by creating a separate board directed fund. The intent of this endowment fund is to provide a permanent source of income to support the Grafton project, on a long-term basis, spending only a portion of the earnings of the fund every year and adding the excess to principal for growth over time. Accordingly each year the Board may spend, if needed, an amount from the fund equal to five percent (5%) of the average net fair market value of the fund’s assets for the twelve calendar quarters ending December 31 of the previous year. * Mailing in your donation to Grafton Heritage Partnership Project or donate on line. * Making a simple Bequest in your will, I give and bequeath to Grafton Heritage Partnership Project the sum of $________ ( or a specific piece of property, such as real estate, stocks, bonds to be used as the Grafton board of trustees determines. * Drawing up an agreement in your Will or Living Trust that contains language that includes your specific wishes. To kick off our Endowment Fund campaign we have a generous offer from an anonymous donor who will match donations dollar for dollar up to $10,000. But, we need your help to establish this fund and we cannot do it without you. A donation or a charitable bequest from you to the Grafton Heritage Partnership Project will secure Grafton’s future as an important historic site for generations to come. Please send in your donation today. Call or email me if you have any questions about our Grafton Endowment Fund.